My husband, better known as "Dada" by the kids, has another love in his life. Sigh. His other love is writing. Screenwriting, to be specific. 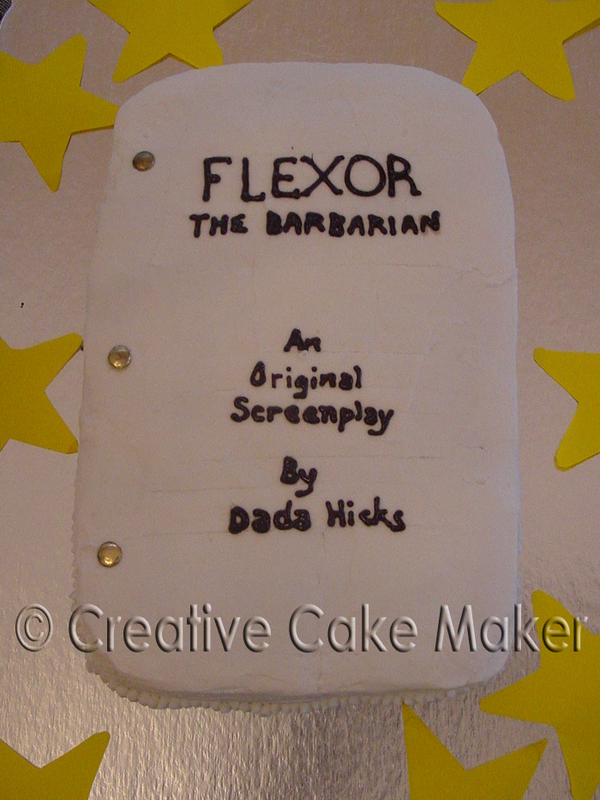 What better way to celebrate his birthday than to have a cake shaped like one of his movie scripts. He was quite pleased with this script...err...this cake. I was quite disappointed...in the cake...not the script. The icing kept wanting to dry before I could get it smooth enough so I spent a LOT of time fussing over it. It still had ridges in it. I would have preferred the cake having corners that were more squared, but the pan had rounded corners. My husband always tells me I am my worst critic - especially when it comes to my cakes - so I figure, even if I don't like it but I can still live with it, everything is fine. Otherwise, the cake itself is very easy to make. 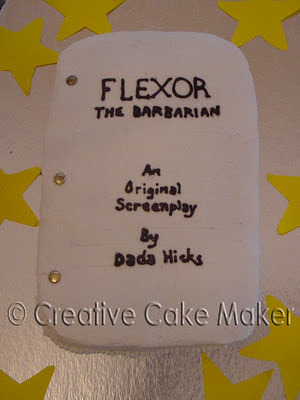 The script cake is a simple 9x13 cake leveled off on top and iced white. The sides have markings to resemble "pages" of the script. The "text" is simple black decorator gel. If you plan on making this, I would recommend skipping the decorator gel. Use black colored icing instead. Gel can get runny. Icing probably wouldn't. Lastly, I placed real (clean) brads along the edge. I think my main problem with it is the absence of color. That's why I had the shiny foil and bright yellow star cut-outs under the cake. It cake it more of a "Hollywood" feel. Oh, and FYI, a script is only supposed to have 2 brads in it...not three. A major faux pas, I hear.